Myki has well-known problems. It’s been an incredibly long saga to get it running, and to the point now where it’s pretty reliable and the government is confident enough to push ahead with phasing-out Metcard. The cost to taxpayers has been huge. Touching on and off can be fiddly, particularly in a crowd and particularly when the readers are dodgy. And who knows what chaos will result when single use/short-term (2-hour and daily) tickets can’t be bought. But somewhere in amongst the doom and gloom there are some genuine benefits from the system. Here’s one: occasional users can set up a Myki card and then forget about it. My kids, who use PT once or twice a week, have cards. They know how to touch-on and touch-off, and I’ve set up auto topup on their accounts. Thus, they can travel as they please and not worry about buying tickets. I don’t need to keep stocks of the old mix of 10×2 hour and Weekend tickets to ensure we get the best value. And I don’t need to keep giving them money for fares which might get lost. 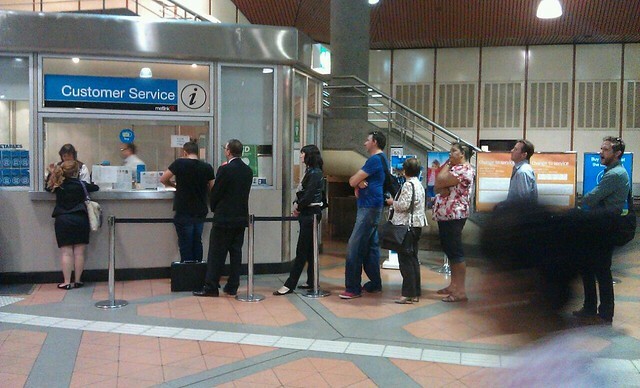 None of us ever need to queue at a ticket machine or counter again. They don’t even have to know how the fare system works. It just works. There is a caveat: I need to make sure my credit card details remain valid, because there’s currently a flaw in the system whereby if an auto topup fails, the card gets blocked and needs to be sent into Myki HQ to be reset. Whoever decided that’s how it should work needs their head examined, and hopefully it’ll be fixed soon. But other than that, that’s a pretty good system for people who don’t travel every day, and a genuine improvement over Metcard. ← Previous Previous post: Christmas present: a punching ball. Daniel, I like the way you often say nice things about the public transport system, which demonstates you have a balance. And are more credible as a result. I still top up myki (for me and my kids) at the station when the cards are low on credit to be on the safe side. Overseas visitors used Metcards while there were here in Melbourne. They liked the look of Myki. In a thoughtful moment one asked what will happen for short time visitors when there are no Metcards? The question is still hanging. I would like to be able to useauto top-up, but looking at the many failures in the design of the system (including the requirement to send a card to an office to have it reset, as you mentioned), there is absolutely no way I will trust them with direct debit access to my credit card. So it remains a manual top-up service for anyone who depends on their credit card and can’t afford to have it overdrawn and frozen by a transport ticketing system already shown to have made incorrect calculations in its transactions. @Philip, yeah I was wary at first too, given the other problems, but most issues have now been solved, so I thought I’d try it. It’s worked fine so far. There are more issues with auto-top-ups. I have three cards on my account and they are all on auto top-up. However I recently had my credit card compromised and now have a new one and so I have to change the card used for my auto top-up. However, to change the credit card I have to do one myki, and then wait a day for the change to take effect and then do another myki and so on. Each myki card has to be changed individually. And then, just to add a bit more insult, I was forced, on eachmyki card, to actually do a top-up according to the auto plan. I now have a card that is rarely used (maybe $15 in the last year) that has $90 credit on it. The card may well expire before the credit is used. To me, the card works fine, it’s just the backend processes that need work. Daniel, would you be able to shed some light on why the minimum on the card for auto-top to take effect is $10? I’d like to make it so it my card will auto top up when it reaches maybe $3 because 99% of my trips are $1.64 and I only travel once every few days, however the system won’t let me do this. There’s no use in having at least $10 of my money sitting on the card at all times, it seems like a waste of money to me. Am I missing some technical reason why this has to be the case or is it just another silly rule? @PaulK, very interesting. Obviously it shouldn’t work like that. Mind you, I’m intrigued to know why you feel you need three separate cards, all on auto topup (assuming they’re all for you). @Mark, they’re probably trying to make it work for people who are on full fares; $10 is not unreasonable for that, to prevent them going negative during a normal day’s travel. I can see it might be a concern for some though. No, they’re not all for me, perhaps I didn’t explain that bit well.. Two are mine (Full fare and Concession) and one is my son’s. I’m also, just about to add another, for other son. Daniel, my kids have been using myki for quite a while, but now I have to change one over to a concession as my son is turning 17. My is that a difficult process! I have to get a VPT form, (which is okay) but then I have to go in to the Discovery Centre with the old MYKI and get issued with temporary cards with no credit on them, apply for a refund of the credit on the old card, put new credit on temporary card so my son can use it until the new cards are sent in the mail, and then apply for another refund for the credit on the temporary card. If they want to avoid fare evaders they need to make it easier. That’s all fine and well so long as Myki doesn’t overcharge you and subsequently top up before it should. At least paying as you go enables you to keep tabs on what you have been charged. Despite the fact that they should give you a receipt at time of purchase or at least a regular statement, the emphasis on ‘give’ and not to have to go chase one up. And how’s a kid going to buy sweets if he can’t walk home and pocket his train fare? I’ve been the victim of a miscommunication between myki and my bank. My card was blocked and I rang to find out what was wrong. Myki claimed bank denial. I rang the bank, they say no problem – all other transactions going through normally. I was bounced around between Myki and the bank until finally the bank just cancelled my card and gave me a new card with a new number and that seemed to solve the problem. It was incredibly frustrating being in this bind, especially as the card had a significant positive balance which I couldn’t use. ALso, why do you have to post in! It seems so antidiluvian!! I still don’t trust it, so I top up manually. It’s better to keep track of things, and there’s no possibility of it all going wrong and having to send it in and being without it for so long. I would use auto topup for the reason you outlined, but I don’t, because of the caveat you wrote about — I’ve heard of too many instances of payments screwing up and blocking the cards. I doubt it’ll get fixed anytime soon, because I doubt there’s actually anyone working on the software to a significant degree. At least, that’s the impression I get. There’s certainly no-one official saying that any of the utterly insane business processes are going to be fixed — or even saying that they’re broken. I agree with Roger in that I see you posting balanced comments about the public transport system. Good work. One of these days it would be nice to see a comparison with the Perth SmartRider, which has been fully operational for 5 years now. Once the teething problems were worked through, it has been going smoothly for so long that any failure is totally unexpected. I’ve been autoloading for years, and yes, it’s very comforting to just tag on, tag off, without having to worry about payments. Sometimes I stuff up and forget to tag off, meaning an $8 default fare – the next day I just phone up and get it reset. Daniel, thanks for the tip. It’s the kind of thing that electronic ticketing can do to make life easier, and I appreciate the pointer. I have used the auto top for a year with no hassles, until, the sudden cancellation of CC due to overseas fraud. Topup triggered next day and a couple of days later, blocked card. I couldn’t believe I could not even give it cash at a cash machine. Nothing. Dead. Get out the wife’s card – she rarely uses it. Mmm better check it’s funding first & cancel auto top up. Both Myki cards on one account. Ahg! Can’t cancel until I put in new CC details, but I don’t have any other CC, & a few days until the replacement arrives. I decide to “print” my statement for the records. Discovery – if you change the card selection without pressing “go”, you get a statement with the card selection header, name , etc, but the transaction list of the previous selection. What next I wonder. Check accounts, shows blocked, but $50 credit. Auto top up seems to have been triggered by presentation to the cash top up machine, the record showing the top up seconds before the cash payment. Ring Myki. Answer after 15 minutes. Sorry computers down, please call back in 2 hours. Go to Metlink shop in Swanston St. I fill out forms, they take my old card, get a large pack of new Myki’s out and give me one. That’s my recent story of Myki, illustrating one disaster of system at every step. Topped up husband’s MYKI with money last year, but hadn’t used the card within 90 days, the topup is suspended, and in order for it to be processed you need to touch on at a top-up machine, which is not convenient if you are not at a major stop. If not, any other topups just go into a queue. and end up backlogged. Myki calls me to advise the replacement is in the mail, but they have noticed the other card is also blocked. He gives me instructions. Please return the card, and as soon as you pay the $10 owed (it shows > $60 credit) to “pay the debt”, we’ll send out the unblocked card. He tells me, you can’t pay off the transaction that blcoked the card by topping up or paying cash, you must use the pay the debt request when you log into the site. Incredible! Who designed this ludicrous system. I am sure the people from the country who come to Melbourne two or three times a year, or people who do the same from interstate, will be absolutely thrilled by this systematic jerk-around.